We all want it, but knowing how to achieve it is the hardest part. And when we achieve it it’s like we’ve discovered the meaning of life and we hold onto it for dear life in fear of losing it. The it we are talking about is glowing skin, and today’s your lucky day because our pal Beverley from Lauren Wood Skin Clinic is here to tell us exactly how to get and maintain it so you can start focusing on other things in life—like the dog you’re planning to adopt. Here are 5 game-changing tricks for glowing skin that you definitely need to try in the lead up to summer. Perth summers are dry AF, so maintaining moisture and hydration is essential for plump, glowing skin. To boost hydration, Lauren Wood Skin Clinic recommends a daily application of Medik8 Hydra B5 and building weekly LED light treatments into your routine. The LED treatments target damaged cells, improve collagen production and increase hydration levels—sounds great to us! And it’s no news to anyone that you should be drinking eight glasses of water each day, but if you’re looking for a boost in probiotics and electrolytes The Beauty Chef Hydration is your hot ticket to hydrated skin. Scientists the world over have been telling us for a little while that we need to listen to our gut when it comes to our metabolism, mental health, hormone regulation and inflammation reduction, and it’s just as important to keep listening when it comes to your skin. A healthy gut and regular bowel movements are crucial for happy, healthy skin and the probiotics in The Beauty Chef’s Glow and Cleanse powders will work wonders to stimulate the release of substance P, a neuropeptide produced in the gut, brain and skin which plays a huge role in attuning several skin conditions. 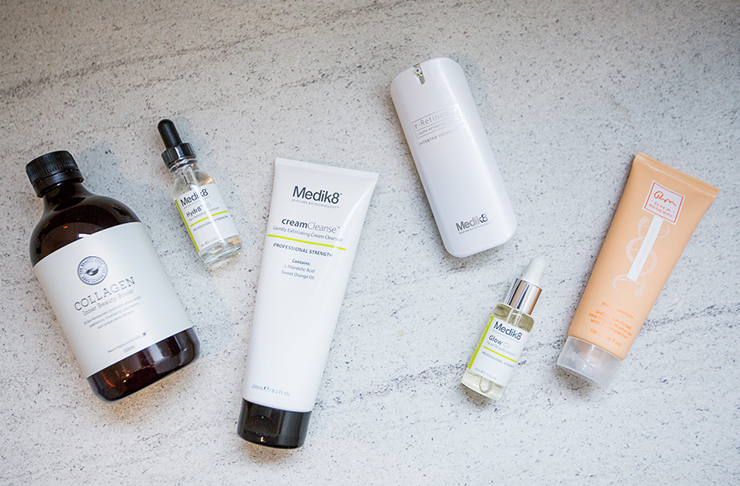 Before visiting Lauren Wood Skin Clinic our skincare routine involved a quick cleanse in the shower and a slap of moisturiser all over the face, but we’ve since come to realise that this simply won’t cut it if we want healthy, glowing skin. Retinol, Vitamin A and C serums provide everything that you need to treat wrinkles, firm up skin and protect your skin from environmental factors. For this, Beverley recommends Medik8’s r-Retinoate and C-Tetra. If you aren’t using sunscreen on the reg, you need to start right now. UV damage is the main culprit of pigmentation and premature ageing, so a broad spectrum SPF that protects against UVA rays (which cause premature ageing, fine lines, and can cause skin cancer) and UVB rays (which cause burning) is an absolute must. DNARenewal SPF 50+ will protect your skin from those harmful rays while reversing sun damage. A good night’s sleep works wonders for your body’s collagen and hormone production, and when paired with the Mesoestetic Radiance DNA night cream and some of The Beauty Chef’s Sleep Inner Beauty Powder the results are amplified. As well as its antioxidant properties, Sleep contains lemon balm and passionflower which reduce nervous tension and induce sleep, as well as sour cherries which are naturally rich in the sleep hormone melatonin—which all goes to say you can expect some of the best shut-eye and wake up glowing! Ready to get glowing? Make an appointment at Lauren Wood Skin Clinic today! Editors note: This article is sponsored by Lauren Wood Skin Clinic and proudly endorsed by The Urban List. Thank you for supporting the sponsors who make The Urban List possible. Click here for more information on our editorial policy.